I missed my 25th college reunion in early October, so I was glad to have a chance to visit campus the day before Halloween. I was officially on campus to interview summer-intern candidates to work for me testing software next summer, but I played hooky a little and spent the morning walking the grounds taking photographs. I shot these photos with a camera I haven’t reviewed yet, a Nikon N2000 film SLR, on Kodak Ektar 100. This day I alternated between the 50mm f/1.8 Nikon Series E lens that came with the camera and a 135mm f/3.5 AI Nikkor lens. 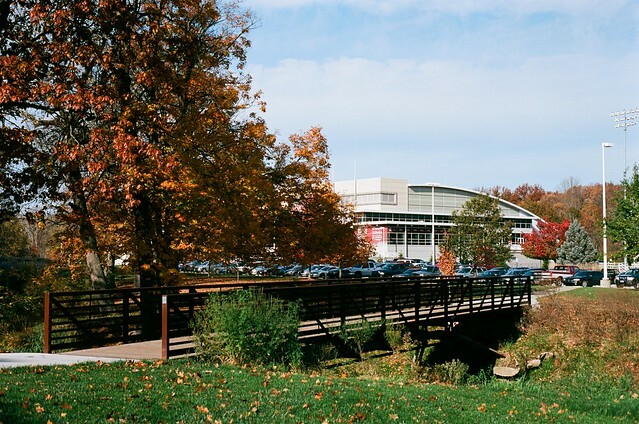 Consistently ranked as the best undergraduate engineering school in the nation, Rose-Hulman Institute of Technology sits on a 200-acre campus in probably the last place you’d guess: Terre Haute, Indiana. It’s on the eastern outskirts of town, actually, on a wooded, rolling plot, which creates a feeling of immersion for students. There’s little here to distract a budding young engineer (or scientist, or mathematician) from study. And that’s good, because this is one tough school. It’s also a picturesque school with lots of great scenes. 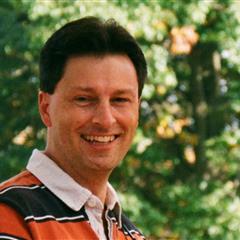 It helped considerably that plenty of autumn color remained. 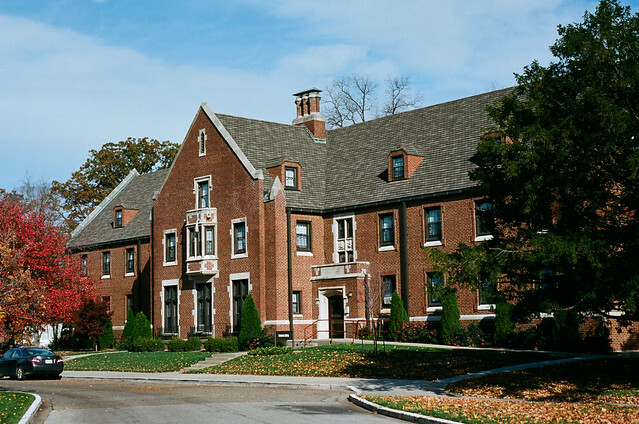 This is Deming Hall, the school’s first and oldest residence hall. 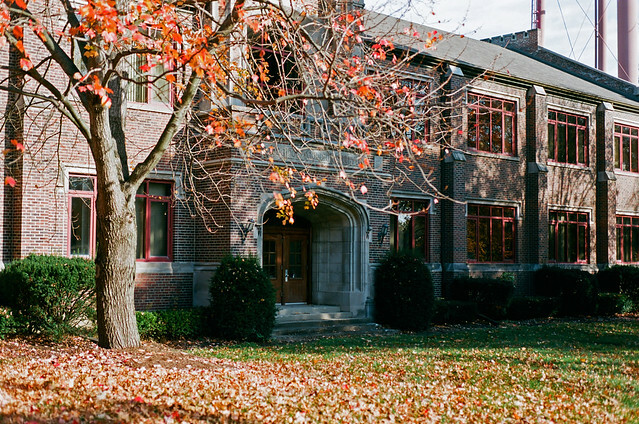 On the right is Moench Hall, the oldest building on campus. Attached to it on the left is Crapo (CRAY-poh) Hall. I spent most of my classroom time in Crapo, as that’s where the Departments of Mathematics and Computer Science were located, and those were the subjects I studied. I stood in the middle of Root Quad to take this photo, which was newly built the summer before my sophomore year, 28 years ago. Before Root Quad, this was just a grassy field with a driveway running up the middle. The wall in front of Moench didn’t exist then, either. This is the front of Moench Hall, which faces US 40. Long before I arrived as a student in 1985, the main driveway from the highway ended at this, the former main entrance to the school. When I was a student here, the campus switchboard sat behind those doors. I worked the switchboard, an archaic concept even in the late 1980s. I had plenty of opportunity to look out on the highway before I knew it had been the National Road, before I’d ever heard of the National Road. Today, I believe these doors aren’t accessible from the inside anymore. 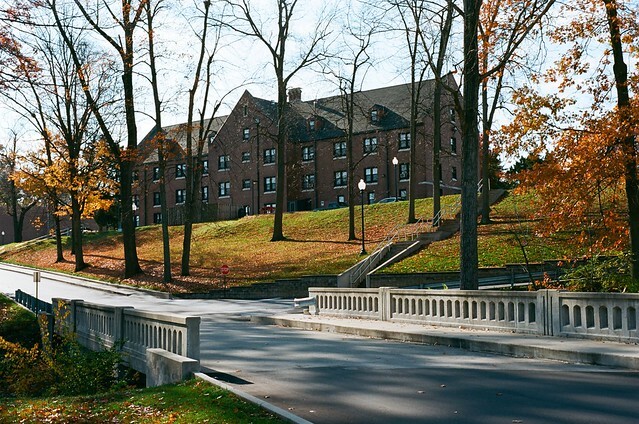 I took this shot from the back door of Baur-Sames-Bogart Hall, in which I lived while I was a student. I took a photo from the same place one spring morning in 1987, on a day when the freshness around me lifted my spirits. See that photo here. This little body of water is known as either Scum Pond or Muck Pond; it even shows up on Google Maps labeled as Scum Pond. Beyond it is Speed Lake. I didn’t spend much time on the back side of campus as a student. This little footbridge over Lost Creek didn’t exist in my day, and neither did the enormous athletic facility behind it. Rose-Hulman went on a building jag in the 1990s and 2000s; campus hardly looks like it did in my day. Rose is one of the most expensive schools in the state. Total cost of a Rose-Hulman education has about quadrupled since my time here — I don’t think I could afford to send my sons. I have to think that all of these buildings are part of why. Fortunately, some recognizable icons remain, such as the smokestack. 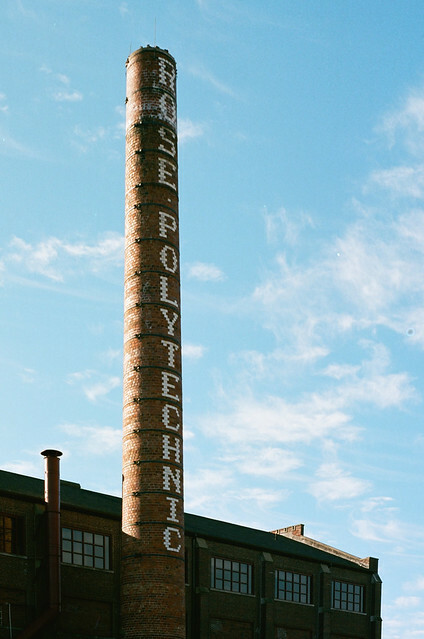 The school was originally called Rose Polytechnic Institute. 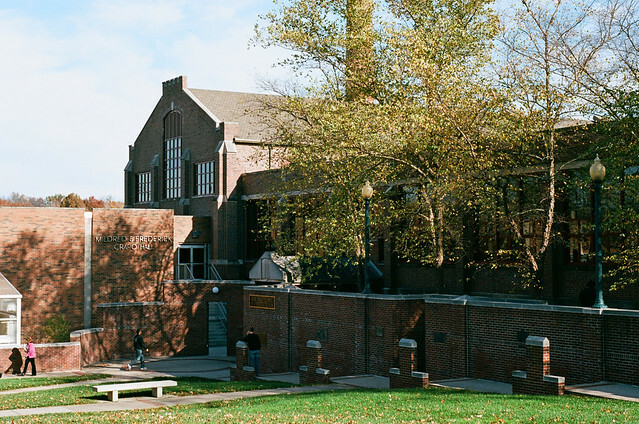 The Hulman family donated the school’s campus, which was enough to have their name added to the school’s on its centennial in 1974. You might know the Hulmans as the makers of Clabber Girl Baking Powder, or for a little racetrack that they own up in Indianapolis. That’s Deming Hall up on the hill, overlooking the vehicle bridge over Lost Creek. My best memory of this bridge is the day in May of 1989 when I marched in cap and gown with my classmates over it, ready to receive my degree. The Rose campus is filled with art. The school has no art museum — no need, as art fills the walls inside every classroom building. 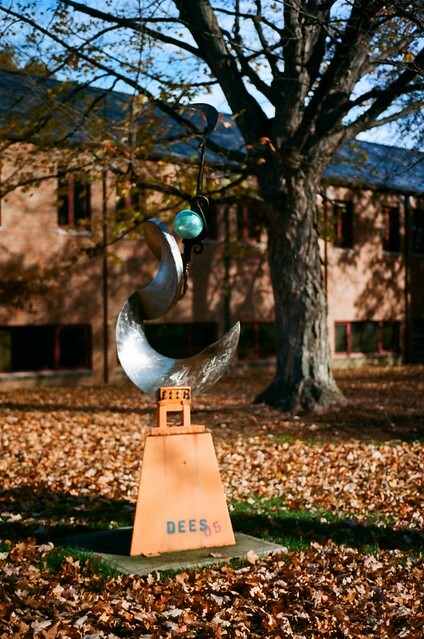 Since I graduated, sculpture has been placed here and there around campus. 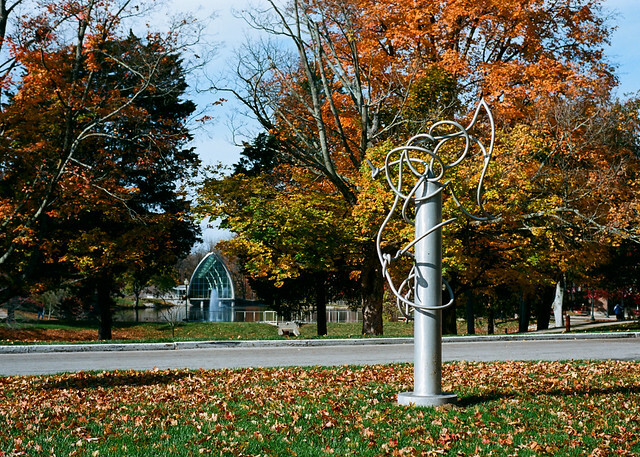 It looks like students created all of this sculpture. I have to admit that most abstract sculpture doesn’t speak to me, although I do appreciate the work that obviously went into making it. I liked this twisty piece best, and I loved how I could get White Chapel into a shot with it. The chapel begs to be photographed. 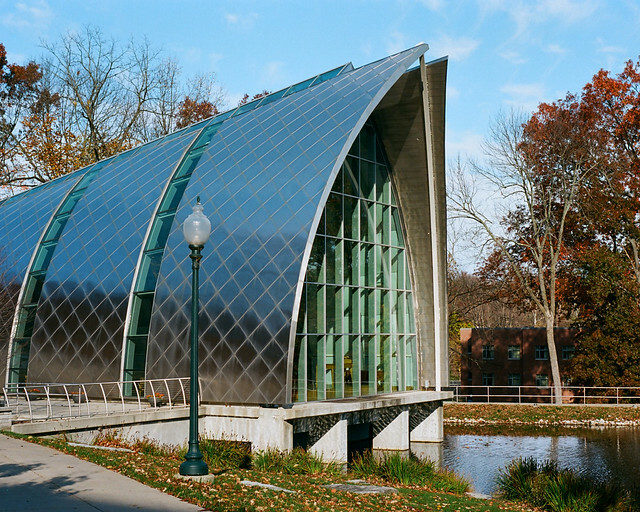 Someone who follows me on Flickr asked if the chapel is covered in solar panels — which would be super cool. But that’s just stainless steel. Somewhere around here I have some late-1980s photos of campus taken from the roof of the building I lived in. (I had an illicit master key.) I ought to post those someday. 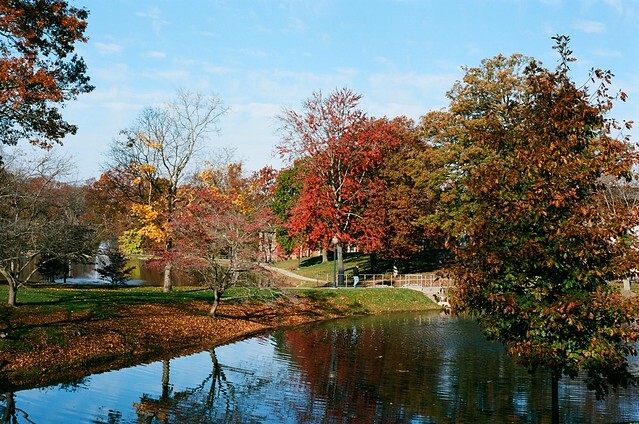 Wish I had visited that campus back when I used to go to Terre Haute a lot. Wouldn’t have expected to find some place so nice in that town. It’s a lot more tightly packed with buildings now than 25 years ago, but it’s a lovely campus. Very nice photos. My favorites here are the smokestack and the chapel. Any idea when the chapel was built? Very modern design! White Chapel opened in 2001. The smokestack is from 1922! Nice work, Jim. Please post the photos from your way back machine if you find them.